The average veterinarian graduating with debt from the class of 2014 left with $153,191 of student loans. The AVMA recently stated that the average rate of tuition growth for vet school is 4.86%. If we extrapolate those numbers to today, the average veterinarian graduating with debt from the class of 2017 will leave with a liability of $176,629.30. An excellent starting salary for a veterinarian graduating from school today is around $75,000 from what many of my friends and clients have told me. Most students in vet school graduate with debt. Hence, many first year veterinarians leave school with a debt to income ratio of at least $177,000/$75,000 = 2.36. With a such a debt load, optimizing the student loan repayment choices for veterinarians to find the cheapest one is extremely important. 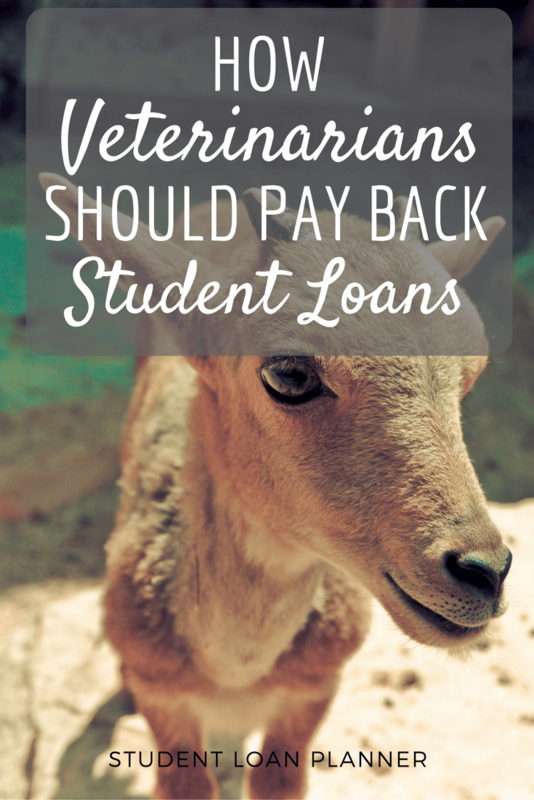 Many veterinarians have never received professional help for their student loans. What happens to many of them is that they choose the wrong repayment plan for their situation. Let’s assume Victoria graduates in 2017 from vet school. She started undergrad in 2009, so she qualifies for all of the major income based repayment plans. Let’s assume she starts out at $75,000 in salary and leaves vet school with the average $177,000 debt load at an interest rate of 6.8%. We will also assume she is single and her income grows at 3% a year. Seeing these loan balances grow over time, one would think that the best repayment plan is REPAYE. After all, it shows the slowest growth in overall debt. To figure out the answer to that question, we next have to look at what the monthly repayments would be for Victoria under each plan. 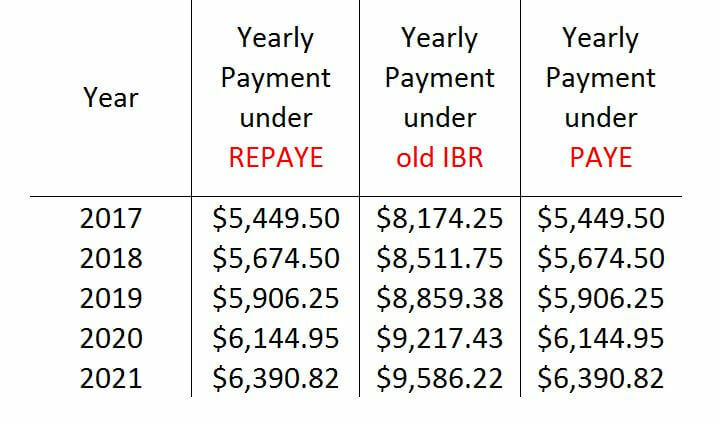 By looking at the annual payments required under each loan program, we see that Victoria would pay the most under IBR, with REPAYE and PAYE tied in annual payments. So Victoria should just use REPAYE and be done with it right? Her loan balance grows the slowest AND it has the lowest monthly payment. Unfortunately, it’s still more complicated than that. If Victoria blindly chose REPAYE, here’s what she would not be considering. REPAYE treats all marital income as joint income for purposes of monthly payment calculation. If Victoria ever got married, she would lose the ability that IBR and PAYE offers her to file taxes separately and thereby base income based repayment on her income alone. If Victoria’s future partner also had a lot of student debt and a similar income, then REPAYE would probably be the best option because of the incredible interest subsidy program in REPAYE. That is, if monthly income based payments do not fully cover interest, the government pays half of the remainder to keep the balance from exploding. That’s why REPAYE has the lowest annual payments AND slowest loan growth above because Victoria would receive a heavy interest subsidy with REPAYE. By comparison, IBR and PAYE only offer an interest subsidy for the first three years of repayment only on the subsidized loans. However, the reason REPAYE looked so good is only because the simulation treated Victoria as single for tax purposes. A proper analysis of REPAYE vs IBR and PAYE has to take into account future family plans or it could be totally wrong. Choosing the right repayment plan for Victoria depends on her starting income, salary growth rate, family plans, spouse’s income, spouse’s salary growth rate, risk preferences, the tax status of her employer, and more. Some veterinarians I speak with have thought through their repayment plan choices very well. Others chose IBR because the unhelpful or unreachable financial aid counselor at their Veterinary College told them so. I did not want to guess when my friends asked me what each repayment plan would cost for their student loans. Student loan repayment program costs depend on over a dozen variables. To model all these variables, I built the first version of my proprietary spreadsheet, which received over 300,000 views and propelled this business into existence. Feel free to use it to model your own debt balance, although I’m excited to announce that I’m building my own custom calculator for veterinarians that I plan on giving away for free in the near future. I would say that 90% of the veterinarians who come to me for help use the IBR program. Some are eligible for far better repayment plans and do not even know it. When I do a consult for someone, I look at every repayment plan available to that individual. I run an analysis to see what plan would save the most money. 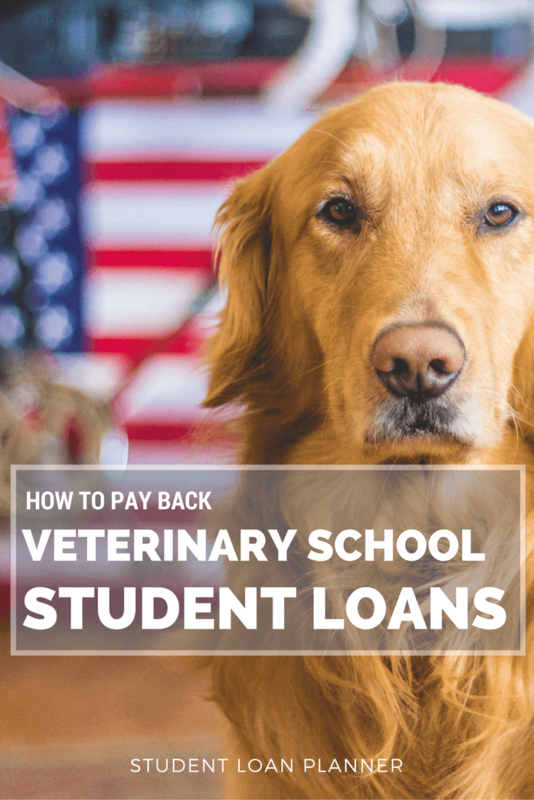 I encourage you to learn about the main differences between the three student loan repayment choices for veterinarians. PAYE (Pay As You Earn) is only available for a subset of recent borrowers. It allows you to pay 10% of your discretionary income. After 20 years of monthly payments, the government forgives your loans. If you qualify for PAYE, it will likely be the best plan to use. That said, anyone using PAYE must save an enormous sum in a side account to pay a potentially huge tax penalty when the forgiveness happens. After all, the IRS treats the entire loan forgiveness as taxable income. REPAYE is the Revised Pay As You Earn program. It came into existence in December 2015, so many veterinarians do not even know about it. REPAYE limits payments to 10% of discretionary income. However, as we saw above it includes spousal income in that calculation. PAYE and IBR allow you to file taxes separately, which is a great benefit if your spouse has no student loans because your monthly payment is based on one income instead of two. The one big benefit with REPAYE is the huge interest subsidy. I have counseled veterinarians who limited their future student loan growth by $500,000 or more thanks to REPAYE’s slowdown in the compound interest on their debt. So it’s something to take a serious look at if you haven’t already. Income Based Repayment (IBR) is the oldest income based repayment plan. IBR is only good if you have no other options. If you are ineligible for PAYE, then the REPAYE vs IBR analysis is very interesting. You weight the lower payment and interest subsidy benefits with REPAYE against the marital income exclusion of IBR. From my experience, most of the veterinarians using IBR never considered alternatives. They use IBR because that was the default option at the time they started paying their student loans. For new borrowers after 2014, the new IBR program essentially replicates the PAYE program. The first class of veterinarians that will likely benefit from this revision is the class of 2018. There’s actually a fourth income based repayment plan called Income Contingent Repayment (ICR). By my expert opinion, it’s totally useless. I have no idea why someone would use it. So you can just ignore that it exists because I’ve never seen someone offer an intelligent reason to use ICR. For all intensive purposes, veterinarians have a choice between PAYE, IBR, and REPAYE. Program eligibility depends on when they started borrowing. So far I’ve been able to save the average veterinarian client approximately $120,000 over the life of their student loans. I do this simply by optimizing their choice of government repayment programs. Sometimes I file for PSLF if applicable. Finally, I can usually find refinancing partners to obtain a lower interest rate if clients happen to have a debt to income ratio below 1.25. For example, a specialist making $150,000 with $120,000 of student loan debt would be able to save a ton of money by talking to me. I could probably get them a $300 refinancing bonus depositing to their bank account along with cutting their interest rate in half. For veterinarians with far more debt than income, I can help you understand your options through the REPAYE, PAYE, and IBR repayment plans. The typical Veterinarian starts life today with a mountain of student debt. I’m not exaggerating by stating that making the right repayment choice can be agonizing when you want to start a family, own a home, or get funding from a bank to start a practice. 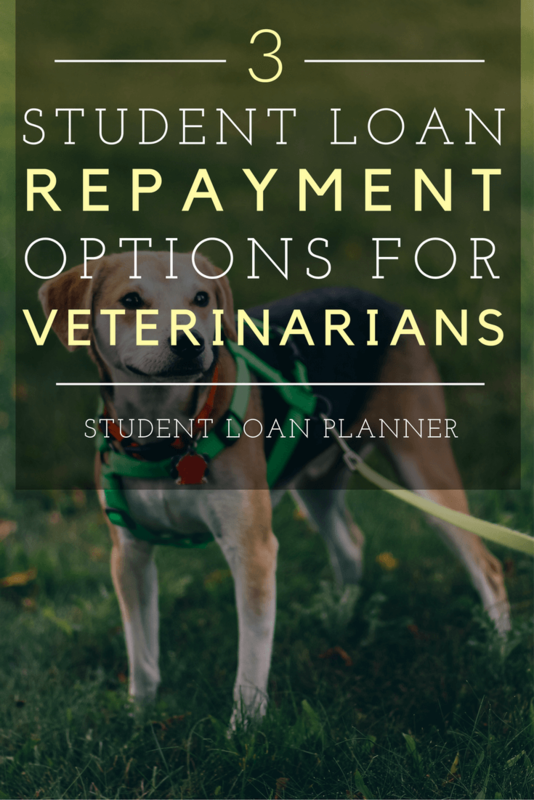 Hopefully you feel a little more at ease knowing that optimizing student loan repayment choices for veterinarians can literally save thousands of dollars. Read everything you can get your hands on about how to deal with the cost of vet school, such as this guide from EasyAnatomy. Whether you are just graduating vet school or have been practicing for years, I’m almost certain I can help you pay less on your student loans. If you’re not satisfied, then I don’t charge you. So far, my clients have loved this service, just check my Student Loan Planner Facebook Page reviews. Read the comments on the first article I wrote for veterinarians on this site, which received 23,000 views over three days. Regardless of whether you hire someone like me or not, please consider the cost of all the student loan repayment choices for veterinarians before settling on one. If you have more questions for me or fellow readers, leave a comment below. It’s a great way to get some free help! Student Loan Planner, LLC provides low cost, flat fee student loan advice. I only charge a one time fee for student loan help. For each consult, I perform a holistic loan analysis to see what your best available repayment options are. If your debt to income ratio is below 1.25, I might be able to get you up to a $300 bonus with lower interest costs through private refinancing partners.